Co-directing change. A guide to the governance of multi-owned projects. Disclosure and reporting; to ensure that the content of project reports will provide timely, relevant and reliable information. 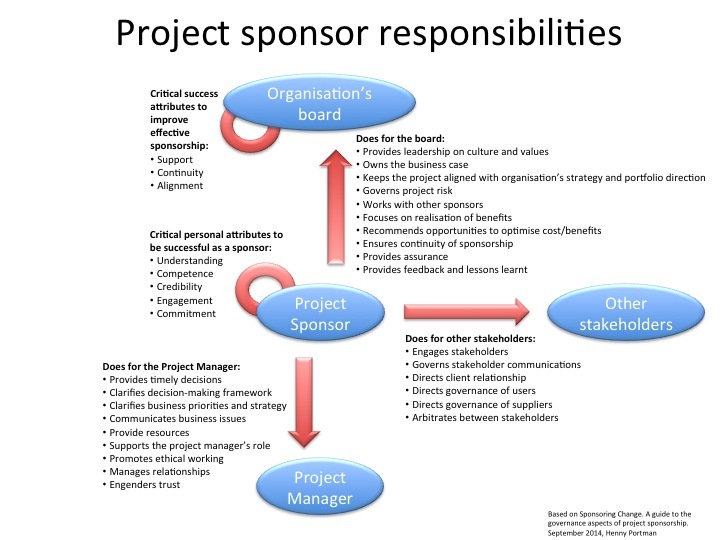 What a sponsor does for the management board, the project manager and other stakeholders. In the appendices you get a checklist to select a project sponsor and sponsorship checklists covering the governance responsibilities. Joining and leaving; to ensure that arrangements are in place to govern changes in ownership. In the appendices you get an overview of multi-owned project models (e.g. joint venture, bidding consortium, alliance contracting, etc.) and the relationship between the principles and SOX. If you are struggling with sponsor responsibilities in your organisation, these small booklets are definitely worth reading. I just came across a book about project sponsors. Being the project sponsor. A practical guide for executives by Ten Gevers and Bart Hoitink. After reading the first pages, I was a little bit disappointed. Not because of what I had read but because of the fact that this was not a new book but a translation of their book Opdrachtgeven met resultaat. Handreiking voor opdrachtgevers aan projecten. That book was published in 2009 and besides one skipped paragraph about sponsorship in public organizations, this book is just a translation. To present this book as a first edition, 2014 without making any remarks or references to the old Dutch book is somewhat misleading. But looking back at my review in 2009, it’s still worthwhile for my English readers to give a review. 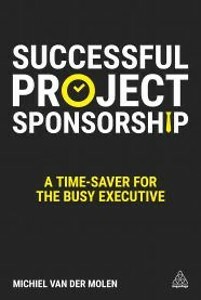 As the authors stated, there are not that many books on project executives or sponsors. projectmanagement door opdrachtgevers An English version of an earlier version of this book PRINCE2 for executives is available too, by Michiel van der Molen. Opdracht geven met resultaat Ten Gevers and Bart Hoitink. Help ik heb een opdrachtgever, by Nicoline Mulder. Project sponsorship, by D. West. Project governance, a practical guide to effective project decision making by Ross Garland. Let’s now go back to their book Being the project sponsor. The book has been divided in eleven chapters (including an introduction). Every chapter ends with a checklist in the form of a mind map and five tips for the project sponsor. The first two chapters focus on the project sponsor, his/her tasks and responsibilities. The next 5 chapters elaborate on the activities (how, when, with what) of the project sponsor during the life cycle of a project (from start to closure). The last three chapters discuss the organization of project sponsorship in an organization, special forms of sponsorship and acting consciously. Three appendices regarding building blocks for the business case, core elements of a project plan and a health-check project sponsorship. Chapter 2 Who is the project sponsor? gives you insights in different types of project sponsors e.g. the specialist, the passer-by, the elected project sponsor, the board and their corresponding consequences for the project or organization. 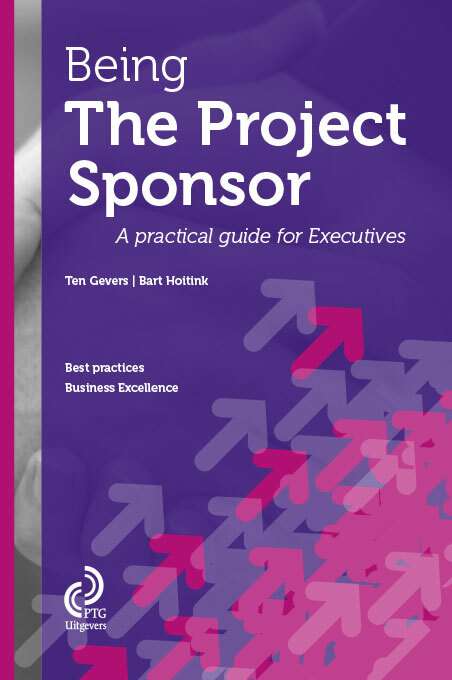 The chapter explains the key characteristics of a project sponsor: a single, prominent person with sufficient commitment and time to do the job, with sufficient authority and being a well-balanced personality. Chapter 3 What does a project sponsor do? explains the focus of the project sponsor (what and why) as well as the project manager (How) including the related responsibilities (RACI). Also the consequence of being a project sponsor as well as a line manager and the potential dilemmas of project sponsorship in practice are explained. E.g. are you as a project sponsor at close quarters or remote, will you focus on the content or the process. Chapter 4 to 8 will follow the project life cycle. It starts with the birth of a project. It’s the project sponsor who must set vision, goals, and expectations. He/She must make sure the deliverables are SMARTI described (Specific, Measurable, Acceptable, Realistic, Transparent, Inspiring). Here we will build the business case to have an instrument for decision-making, communication and to direct. This step will end with the formulation of the assignment for the project manager. Chapter 5 Focussing the project starts with the selection of the right project manager, the assessment of the project plan, containing the seven wh-questions (why, what, which way, who, with what, where and when) and determining the boundaries. Chapter 6 Organising the teamwork is about the communication, the set up of a project board or steering committee, the project deliverable matrix, the stakeholder involvement and project assurance. As stated earlier in the review about their Dutch book, these topics, in my opinion must already be addressed during the focussing or initiation part of the project. Chapter 7 Keeping the ship on course shows what you have to do to make the project a success. You must show your involvement, monitor progress, take timely decisions and keep your project manager and yourself focussed. I am going to use the picture with the iceberg regarding monitoring progress during my project board awareness workshops. It’s a nice picture to trigger some discussions (thanks for that). Above the water you see e.g. the business case, scope, risk, progress reports and under water you get a self-evaluation of yourself and your relationship with your project manager and the analysis of stakeholders (process and project). The last chapter (8) in this block Concluding the project is about the, sometimes premature, project closure. It starts with the finalization and handover of the project products and the business case to get clarity about the benefits to be realized after going ‘life’. Followed by the evaluation and termination of the project including the formal release of the project manager and yourself as a project sponsor. The last three chapters give you insight in some related topics. 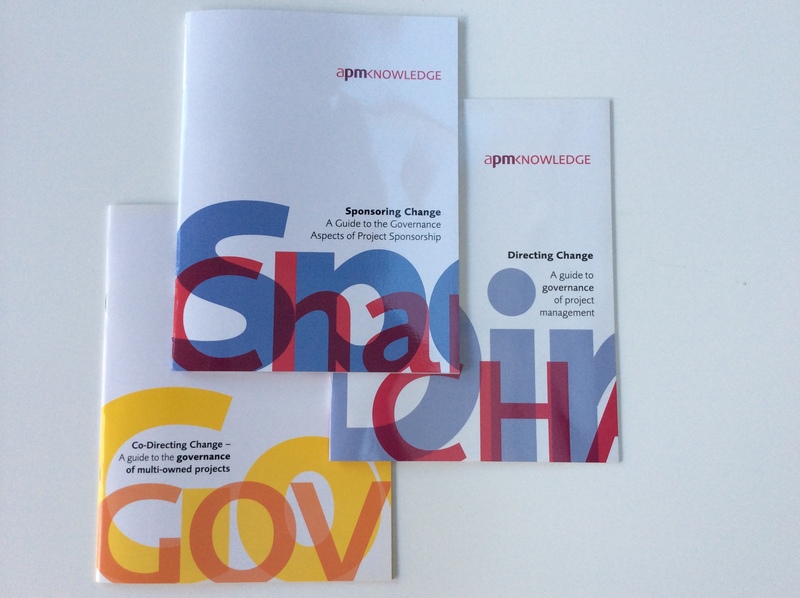 Chapter 9 Organizing project sponsorship gives insights how sponsorship can be governed or supported. How are projects positioned or anchored in the organization. Do you have to do it all by yourself or can you delegate project sponsorship, what is the impact of portfolio management and what kind of support can you get from different types of project offices. Chapter 10 Special forms of project sponsorship gives some background of working with multiple parties; the consortium, international project sponsorship, sponsoring a programme and some other forms of collaboration. The last chapter (11) From plan to action explains issues which influences project sponsorship. Based on the triangle dimensions (project, context and project manager) relate to you as a person. Project sponsorship is a personal matter and all dimensions must be balanced in themselves and in relation to the others to be successful. You can base your opinion on a set of questions and see where you have to take action or influence before you go ahead with the project. The book is easy to read, doesn’t overload you with theoretical background and gives you practical tips, guidelines and step-by-step plans to make your project sponsorship a success.